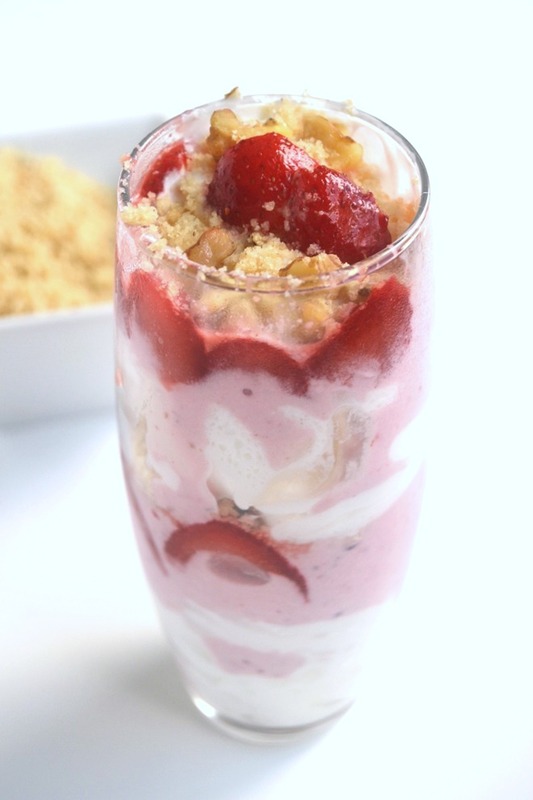 These Strawberry Cheesecake Parfaits take 5 minutes to make and are the perfect dessert. Made lighter with Greek yogurt and fresh strawberries. At a recent work event, the icebreaker exercise was really neat. We had to take a penny randomly from a jar and tell the group a memory that happened during that year. People had all kinds of responses such as that they were in school or that was the year that their child was born. I got the year 2000 and I said that my main memories around that time were of my family's farm. I talk a lot about the farm on my blog and it is because it's a huge part of my life, especially when I was a child. We went there every weekend and for every school vacation. I have a lot of memories when we first purchased the farm as well. There was quite a long period of time before we could move in to the house because someone was still living there. That didn't stop us from going there and doing work though. I remember my dad having our big van hooked up to a trailer along the road and cutting down trees. We all had to help. I was in third grade, my brother in first grade and my sister was in preschool. It felt like we worked all day, everyday, which I'm sure is not actually the case- haha. We had meals out there too and I remember having Ruby Red Squirt and homemade chili with the family. My dad made the property look great which of course is always a constant work in progress, as with any land. It always requires upkeep such as it needs the grass cut or a tree falls down and needs to be chopped up and moved. To keep everything going, my dad is constantly planting new trees. He has a huge water tank which can hold 300 gallons of water. I like riding around in the trailer with him and helping to water the trees. It is funny how everything changes as time goes on but certain memories stay with you. This dessert is perfect for summer and really simple to make. I used Greek yogurt to make them healthier but they are definitely a dessert that should be eaten as a treat, not everyday. 1. In a food processor or blender, combine the first 4 ingredients and blend until smooth. 2. Take 4 glasses and layer with strawberry cheesecake mixture, strawberries, whipped cream and crushed cookies. Top with walnuts. These turned out awesome! You could also make them with blueberries, key lime Greek yogurt or fresh peaches. The whipped strawberry cheesecake mixture turned out awesome with the frozen strawberries. Enjoy! This recipe looks so tasty! I love how easy this recipe is and love that you used the pecan shortbread cookies in this, so yummy! !